DPM works hard to book shows direct with venues, but we also so enjoy collaborating with Promotors who programme shows of a similar profile to dS:uK. If you would like to work with dS:uK on a show (or run of shows) anywhere in the world, then I invite you to contact us on programming@davephillipsmusic.co.uk. 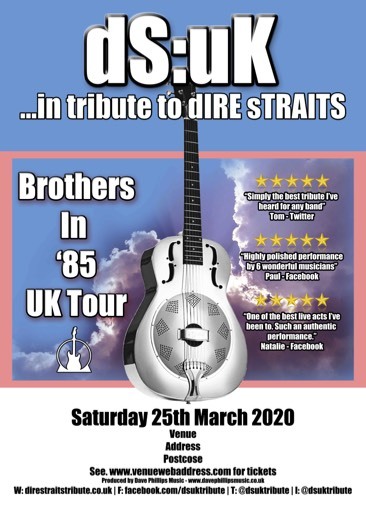 For 2020 - dS:uK are touring the Brothers in Arms Album under the name of "Brothers in 85 Tour"
For 2021, dS:uK will be touring the UK with the band's final tour - On anoTher Night. 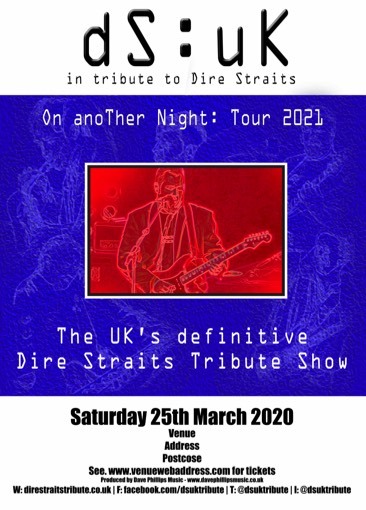 dS:uK tour a different show each year to keep it interesting for our treasured following, and to give them a reason to visit us on each performance. The band regularly negotiate split and fixed guarantee deals with venues and promotors, as well as programming shows directly on a Hire basis. We're very enthusiastic to speak to Programming managers and Promotors about how we can bring our show to your venue in a way that is beneficial for both parties.